Creating fire is obviously important for survival. But many preppers buy stone-age fire products while skipping over the lowly fueled lighter. You should have a handful of cheap BIC lighters across your home, car, and go-bags — we like the $10 BIC Maxi 5-pack and $8 BIC Mini 5-pack. One of the best refillable lighters is the $15 Maratac Peanut (not the Zippo or butane cigar lighters). A great EDC lighter — which also serves as the best windproof lighter and best electric lighter — is the $30 Survival Frog Micro-USB Rechargeable Tesla. As cool as it is to light a fire using old-school camping skills, soldiers, experienced survivalists, and celebrity bushcrafters the world over all tend to use a cigarette lighter as their primary go-to. Primitive methods are the backup. Besides being absurdly cheap and common, disposable lighters are a miracle of modern manufacturing. Capitalism and the strenuous demands of chain smokers have created an easy to use, compact, lightweight, durable, reliable, and effective product that lasts decades on the shelf. How many $2 products can you say that about? Although it’s fine if you stick with disposable lighters for your emergency fire kit, they do run out of fuel, so it’s worth the extra $20 to have refillable or rechargeable lighters that save you money during daily use and create long-term versatility after SHTF. Refillable lighters tend to leak, so they aren’t as convenient for long-term storage as disposables, but the right refillable lighter can run on many different fuel types. This fuel flexibility makes them great backup preps for long-term emergencies, where you may be scavenging fuel from odd places like perfume bottles or paint supplies. There are specialty products (eg. butane torch lighters) that are popular for camping and backpacking scenarios, but almost all of these have shortcomings that disqualify them as your primary fire prep. See below the fold for more details and picks. Compact, durable, leak-proof, cheap, and lightweight. The Maxi version lasts twice as long as a normal BIC. Same quality as a normal/Maxi BIC in a ~30% smaller package, just with fewer strikes. Great for everyday carry or as a backup you can tuck almost anywhere. Hands down, the BIC Maxi ($2 each, $10 for the five pack) is the best survival lighter for most people. The Maxi lighters are good for 3,000 lights — defined as a strike of the flint that produces a flame of one second in duration — about twice what a normal BIC is good for. Also great is the $2 BIC Mini lighter, a very small lighter that can easily be tucked in a dedicated fire pouch or the watch pocket of your pants. Obviously you don’t get nearly the number of lights as you do with the Maxi, but this is a capable backup option that can get you out of a bind. Although not necessary, there are a few solid lighter accessories that upgrade your BIC for survival and everyday carry. Keep your lighter dry or strap it to your gear with this rugged, waterproof, floating case. First up is the $15 Exotac fireSLEEVE Ruggedized Waterproof Lighter Case that keeps your lighter safe and dry. The sleeve floats and has an attachment point for a carabiner or paracord loop. The blaze orange body makes it easy to find, especially when digging through an emergency kit at night or without power. Turn your BIC into a mini-tool with this stainless steel case. Adds functionality with minimal bulk. This attachment clip is a great combo with the LighterBro. The $13 LighterBro is a very popular little multi-tool-like lighter attachment that features a knife, scissors, tiny screwdriver, bottle opener, and keyring. It’s made of sturdy stainless, and adds a bit of functionality and durability to your BIC without adding much bulk. The one thing the LighterBro is missing is a clip, but there’s a $6 add-on LighterBro clip attachment that lets you easily secure it in a pocket on a belt. Many LighterBro users consider the clip a must-have add-on. Your stash of BICs will eventually run out in a long-term grid-down scenario. Refillable lighters make sense, provided they can use a wide range of fuels you may scavenge and can hold that fuel for a long time without leaking. The best refillable lighter is the $20 Maratac Anodized Peanut. Sturdy, reliable, lightweight, affordable, and without the leakage flaws of other refillables --- a few of the reasons why the Maratac Peanut lighter has stayed on the market for years. Its all-metal construction is far more durable than the BIC, and it’s also sturdier than most specially designed “survival” lighters. The Peanut is available in a variety of size and metal combinations. We own and use the $55 Maratac Peanut XL in titanium, and it is awesome. It feels great in the hand, lights reliably, and most importantly, its rubber O-ring and screw-top design holds fuel for months at a time. If you have a refillable lighter, keep some proper fuel in your home supplies and possibly in your go-bags. We’ve seen a few online reports of leakage with these lighters, with some users claiming they get as little as two months of storage before the fuel evaporates. There are enough of these reports for us to think this is a real issue in a small percentage of ‘lemon’ lighters, even though our own Peanut stores fuel indefinitely and many other reviewers agree. We’ve personally seen Peanuts stored for a year without use light up on the first try. Even if you get a Peanut that only stores fuel for two months and decide not to exchange it, we still think the fuel flexibility and widespread availability of replacement parts make this lighter a solid investment and a great tool to have in your emergency preps. There are a handful of decent competitors to the Peanut. Many are knockoffs, a few have unique differences, and most have design flaws, quality problems, or availability issues. Our best guess is that the market for these refillable survival lighters is very small, and Maratac is the only company committed to it for the long haul. Numyth Tohil: If it were still on the market, we’d consider the Numyth a decent alternative to the Maratac. But you might still find one for sale on eBay or flea markets. Everstryke Pro: Not widely available, and we think it looks cheaply made. We’ve noticed the Everstryke is commonly given away for free as an incentive to get people to give away personal information online or fill out scammy forms. Exotac titanLIGHT: A nice-looking lighter introduced in late 2017 from a quality brand. But we don’t like the design when compared to the Peanut’s capsule. The problem is an abundance of O-rings — there’s one at the top where the wick is, one at the bottom where you fill the lighter, and (according to this video review) one that’s inaccessible on the inside of the lighter. O-rings give out over the long run, especially when exposed to the kinds of chemicals used to fill lighters, so each one is a point of failure for leakage. The original Peanut design has only a single O-ring to wear out or fail. Although the Zippo is a frequently-recommended classic among survivalists — and an otherwise fine daily-life lighter — fuel evaporation is a real problem that can empty the container in a week or two. There are aftermarket products to address this problem, such as the $30 Thyrm PyroVault Lighter Armor case that takes Zippo lighter inserts. But that case isn’t water tight and doesn’t completely solve the evaporation problem. The $15 Z-Plus 2.0 butane torch insert goes inside a Zippo case, turning it into a butane torch of the kind we do not recommend for prepping. A plasma lighter — which is powered by electricity and thus rechargeable — is a nice upgrade for daily use, camping, and backpacking. But plasma lighters are not good enough to be your primary prep. Technology is advancing rapidly enough that most people will have the ability to charge small devices (via solar, wind, crank, or batteries) through a micro-USB cable as part of their emergency bags. The ability to use a wide range of fuels in Zippo-style lighters, however, still beats these electric versions for long-term preps. 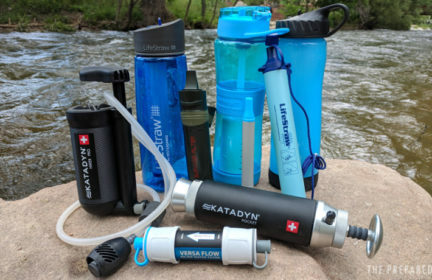 Personally, we keep some of these on hand for their convenience, coolness, and as a backup to the primary BICs and refillable variants in our emergency supplies. Waterproof. Windproof. Micro-USB rechargeable. A charge lasts for 1.5-2 hours of Tesla-plasma-awesomeness. Waterproof and windproof, the micro-USB-rechargeable $30 Survival Frog Outdoor Tesla Lighter uses a small arc of plasma to ignite whatever material you’re trying to light. So this lighter and other flameless lighters like it are immune to forces like extreme wind and rain that keep more traditional lighters from working. This style of lighter is white labeled by many different brands. We like Survival Frog for their great customer service, but you can sometimes find the same-with-a-different-name Tactical Gear Plasma Lighter for a few dollars cheaper. Alternatively, the UST TekFire Pro is a popular competitor. The main issue with plasma/electric lighters is the Lithium-Ion battery. We’ll dig deeper into the pros and cons in the beginner’s guide to batteries, but Li-Ions don’t do well when stored unused for long periods of time and have a limited number of charge/discharge cycles. We also wish the gap where plasma streams cross and ignite your material was larger — but that’s probably a basic limitation of the Ghostbusters-style energy beams and battery drain. It can be difficult to ignite larger objects or at weird angles, as there isn’t an open flame you can hold up to something. Vice versa, you can light upside down with a plasma torch without the flame rising and burning your fingers. Butane lighters are loved by cigar smokers for their even, odorless flame. The strong “torch” output is marketed as a windproof flame, which lead some companies to release survival-focused variants. But many users have found that these torches don’t resist the wind as well as advertised, so the pros don’t outweigh the cons. Another big problem with butane cigar lighters is reliability. The popular survival lighters that we investigated all had very mixed reviews, and the strictly cigar-oriented lighters just aren’t made for harsh outdoor conditions, often failing in the field. Finally, these lighters run out of fuel quickly, so they’re just not practical in longer-term emergencies. Despite all these drawbacks, some preppers like that these lighters can hang onto their fuel for a long time in storage. Another positive is that when you crank their output all the way up, butane torches do often work better in bad weather than a plain BIC. This may be the only cigar accessory that we actually recommend as a survival item. Reliable, inexpensive, and throws a flame that can stand up to nasty weather. If you want to pick one up anyway, check out the $20 Vertigo Cyclone Triple Torch, a relatively inexpensive portable lighter that’s a popular recommendation on cigar enthusiast forums. These lighters are reasonably durable and reliable at a fair price.